The scientists who research our planet's poles have a tough, incredible job. 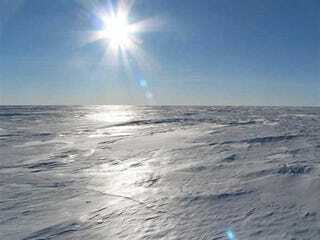 Drilling tens of thousands of feet into the icy surface to retrieve core samples reveals a lot about our planet. It also provides a refreshing, pre-historic drink. Edible Geography has a fascinating interview with Dr. Paul Mayewski of the University of Maine, who collects deep core samples from all over the world—from Antarctica to the Himalayas. By digging deeper and deeper, he and his team are able to examine the icy record to see what was up with the earth's climate thousands of years ago. Once a sample's been drilled out and retrieved, it's sliced apart with lasers for analysis. You might think you couldn't drink that water, because the whole point is that we've detected pollution in it. But these are the chemicals that have been traveling in the atmosphere, and so, yes, it might be a thousand times more polluted than the pre-industrial atmosphere was, but at the locations where we're sampling it, in these very remote areas, the pollution has had a long travel distance and a lot of it has dropped out along the travel route. We're looking at the very final fringes of it. We're still seeing dramatically elevated levels, comparably, but it's not anywhere near undrinkable. Think that isn't badass enough? "We drink water from the nuclear bomb test era, and it has small amounts of radioactivity in it," says Mayewski. But it's no more dangerous than going out in the sun, he assures. If the ice is old, it will often trap air bubbles in it. Those air bubbles can contain carbon dioxide from ten thousand years ago or even a hundred thousand years ago. And when you put an ice cube of that ice in a glass of water, it pops. It has natural effervescence as those gas bubbles escape. You get a little a puff of air into your nostrils if you have your nose over the glass. It's not as though it necessarily smells like anything - but when you think about the fact that the last time that anything smelled that air was a hundred thousand years ago, that's pretty interesting. I am now staring at my current glass of water with disdain.